A new sign for GEN Japanese Cuisine has been hanging at West Park Plaza for months, but renovations for the new restaurant seem to have halted. The new sign for the restaurant appeared around September 2010. However, peeking though the window, it appears that construction has not advanced since then. 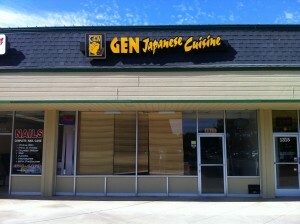 Regency Centers, the owner of the West Park Plaza located at Payne and Winchester, had announced in May 2010 that they had leased space to Masa’s Sushi Japanese Cuisine, a sit-down restaurant serving Japanese cuisine, sushi and noodles. It is believed that Masa’s is now named GEN. This entry was posted on Tuesday, December 28th, 2010 at 2:35 pm by John Vink	and is filed under Uncategorized. You can follow any responses to this entry through the RSS 2.0 feed. You can leave a response, or trackback from your own site.